I've shot more than my fair share of IDPA matches over the past few years, so it's about time for me to shoot a sanctioned match. As luck would have it, several of the local shooters worked together to put on a match in Tyler, TX so I didn't even have to travel! This was a lucky break as the travel expenses have deterred me from shooting anything but local matches. As a wheel gunner, I elected to shoot in the Revolver Division. IDPA's Revolver is divided into two categories; Stock and Enhanced. I typically shoot in the REV - S division with 115 power factor .38 Special ammunition and speed loaders. The REV - Enhanced division allows for a moon clips as long as the rounds meet the higher power factor of 155. 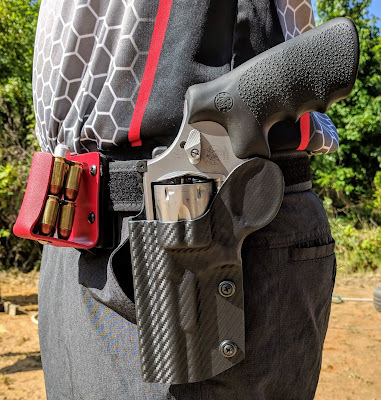 Most factory .45ACP that isn't loaded light, but the shooter I borrowed this revolver from was happy to load up some rounds for both practice sessions and the match. The eight stage event was held at Rose City Flying Clays on July 13-14, 2018. As the match was held on one large bay, the participants were divided into four squads, with a morning and afternoon shoot each day. I chose the Friday morning squad. The arrival time was early, but I figured that was better to get up before dawn than shoot in the heat. I arrived at the range that morning and after a detailed safety brief, we were ready to shoot! Before we get to the individual stages, I wanted to discuss my rig for the match. The revolver I competed with was a Smith & Wesson 625 JM. It features an Apex Tactical Evolution IV Hammer and an Apex Extended Firing Pin resulting in a trigger pull between six (6) and seven (7) pounds. The 625 is chambered in .45ACP and while there is a more felt recoil, the Hogue X-frame Tamer grips cushion the recoil. I wish Hogue manufactured a version with no finger grooves, because I hate those grooves. I've mentioned before that I am very fond of moon clips and believe that all revolvers should be cut this way. This is especially true with the big round-nose bullets. The full moon clips load and unload incredibly fast compared to speed loaders. Even with the high power factor that is required to use moon clips, this was a lot of fun to run at my first sanctioned match. Now onto the stages! Stage One of the match required three shots per target from behind the fault line. There were three levels of priority which required targets to be engaged from near to far. As the Smith & Wesson 625 cylinder only holds six rounds, I reloaded after engaging every two targets. This was a great warm up stage! Even with a misfire, my total time was 27.41 seconds with no points down. My overall placement was 52nd out of 72 shooters. Stage Two was the standards stage. Targets were engaged in priority from near to far behind a designated fault line with each target receiving only one round. Between each fault line shooters were required to swap from freestyle at ten yards, strong hand only at seven yards, and weak hand only at five yards. This was challenging, but I was only seven (7) points down with a total time of 50.58 seconds. My overall placement was 42nd of 72 shooters. Stage Three required one shot to the body and one shot to the head on each target. The first target array went well, but a misfire on the second array threw off my game a bit. That makes two misfires at this match after just three stages. Luckily, the round went off the second time under the hammer. I was only two (2) points down with a total time of 36.48 seconds. My overall placement was 53rd of 72 shooters. Stage Four began with shooters carrying a stuffed giraffe, named Tubby, that must be returned to his tub after engaging three targets. Many shooters elected to hold Tubby by his tail while shooting and drop him into his tub on the way to the next position. We were warned that Tubby was a delicate giraffe and could potentially bounce out of his tub. Those that aggressively released Tubby had to retrieve him from the mud before gently placing him in the tub. Tubby cooperated for me and I finished the stage only two (2) points down with a total time of 29.41 seconds. My overall placement was 44th of 72 shooters. Stage Five did not require the first array to be shot strong hand only, but the drop turner target moved quickly when the rope was pulled. At that distance, I figured strong hand only made the most sense. This turned out to be a good strategy and several shooters followed a similar plan. At the final position, a mover slide along a cable. I may have been trying to hard to avoid the no shoot because my shoots were on the far edge of the target. My second to last shot was another misfire. That makes three light strikes. I finished with seven (7) points down with a total time of 34.80 seconds. My overall placement was 57th of 72 shooters. Stage Six was going relatively well until my second reload. I struggled with the moon clip for a few seconds before it seated in the cylinder. This ate up time and moved me way down the list. Upon further inspection, the case mouth had a burr that hung up on the cylinder. I must have missed this when loading that round into the moon clip. At least it wasn't another misfire. I finished one (1) point down with a total time of 35.41 seconds. My overall placement was 71st of 72 shooters. This was my worst stage. This stage featured for a car prop. We don't usually have vehicles on the range, so I thought that was pretty neat. When making ready for the stage, the moon clip would not seat in the cylinder. I remember the previous stage and rather than forcing it, I swapped to another moon. The first array went well, but the reload was a disaster. After fiddling with it for a few seconds, I chunked it rather than stowing it. Leaving live rounds is a procedural penalty, but my time was so poor the match director didn't give me one. If you listen, you can hear another shooter comment on the misfires that day. Further inspection revealed a split case, so I'm glad it didn't chamber. I finished one (1) point down with a total time of 39.87 seconds. My overall placement was 69th of 72 shooters. Stage Eight featured an unloaded start and required shooters to stow any ammunition they needed before proceeding. I figured that I would bring the third reload just in case the ammunition decided not to cooperate once again. Thankfully, everything loaded correctly. I tried to leave the first position before engaging the third target and crowded cover after my reload. I was pretty tired at this point. I finished one (1) point down with a total time of 38.08 seconds. My overall placement was 50th of 72 shooters. I finished the match just as it started to warm up around on Friday afternoon. It was a very early morning, but I was glad that I completed the match before the heat of the day. Dinner and a small award ceremony was scheduled for Saturday evening after the conclusion of the match. After a decent burger, I went into the clubhouse for the ceremony. It was a bit warm, but I got to chat with other shooters about their performance on the stages. Despite the competition (myself), I managed to take home a nice plaque as the 2018 Revolver Division Champion! I don't know if I really deserved a trophy as the only shooter in my division, but it is proudly displayed in my office. I enjoyed my first sanctioned IDPA match and plan to shoot a sanctioned match or two next season. I really hope that this event happens again next year! One final note. While receiving my award at the ceremony Saturday evening, another shooter said that several folks planned to join me in the Revolver Division for the 2019 season. This is pretty exciting news! Competing against other revolver shooters is a welcome change. We'll see how many are up to the challenge! You had a concerning amount of ammo problems. Between burrs, light primer strikes, and a freaking split case (! ), I would seriously look at finding a new source of ammo if you decide to run a .45 ACP again. Your sentence in the beginning explaining why you ran those reloads isn't quite clear enough for me to understand your reasoning for not running factory ammo. That being said, it is interesting seeing you work through those problems on the clock. You shot a heck of a match, I'm looking forward to seeing you compete more in the future. In IDPA, REV-E division is 155 PF. Factory Federal .45ACP is near 205 PF (230x890)/1000! Lighter reloads make a lot more sense. There were three case issues that I missed when loading. Mistakes happen and I don't hold it against him. I think the action needs to be set just a bit heavier to avoid the light strikes. It'll be easier to compare myself to other revolver shooters next year. Thanks for reading!